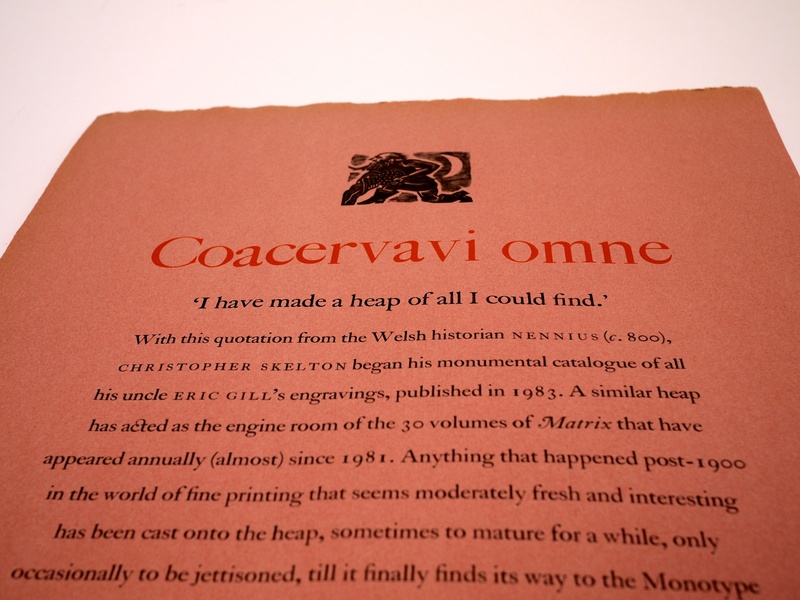 I was recently able to acquire a few items from the Whittington Press and I’ve been pretty excited about sharing sharing my thoughts on them for a while; but as sometimes happens, life gets in the way and it’s taken me much longer than I had planned. Nevertheless, here we are. In this first post I’ll look at some of the posters and ephemera that they’ve produced over the years, and in a followup post I’ll take a look at Matrix 30. 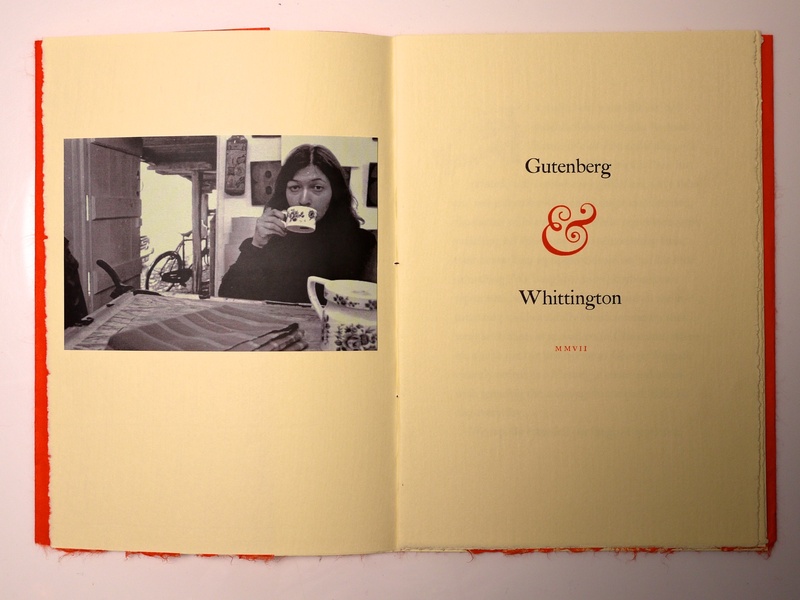 The Whittington Press is a small, though proficient, press started by John and Rosalind Randle in 1971. The press is housed on the grounds of the Whittington Court in Gloucestershire, U.K., in a quaint building that was formerly a gardener’s shed that’s been adapted and expanded over the years to house a growing number of presses and type. 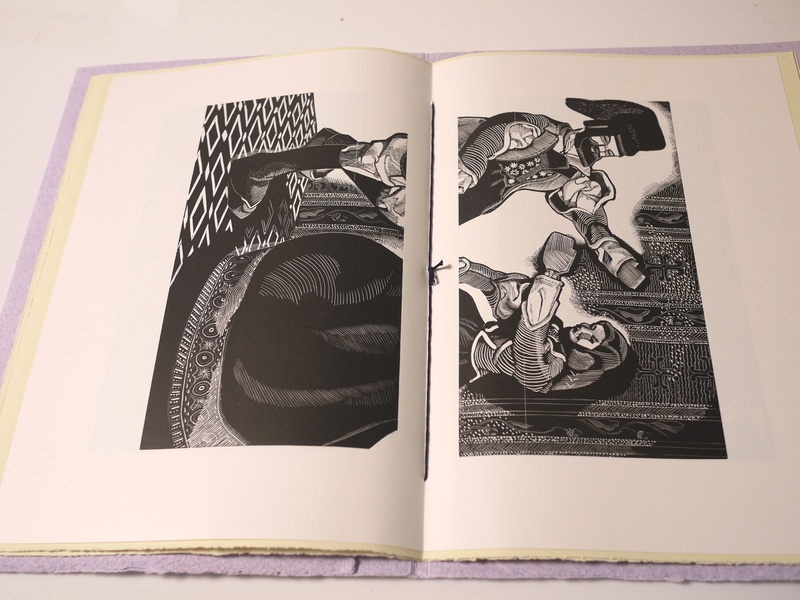 They published their first book in 1972, and have since added over two hundred more to the list with books about wood-engravers, bibliographies of other presses, type specimens, diaries, stencil illustration, and of course, the renowned annual review for printers and bibliophiles – Matrix. The only other printing that the Press does apart from books is posters, which have become quite popular in their own right. 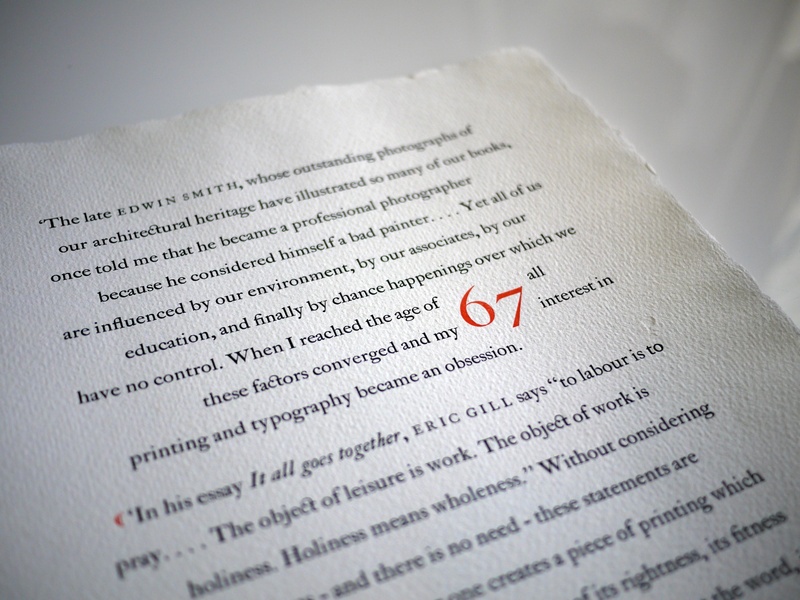 John Randle explains that posters serve a dual purpose – they allow the Press to take a break from the discipline of book-work while also allowing them to showcase some of the larger sizes of type that they have in their collection but wouldn’t otherwise be able to use for their regular projects. You can also see pictures from the 2011 Open Day over here. 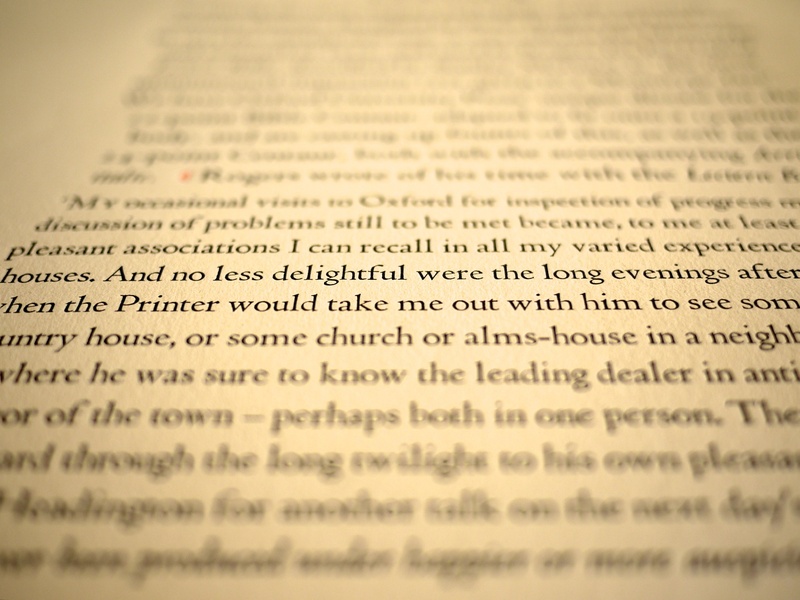 In 1982, ten years after it had published its first book, Richard Kennedy’s A Boy at the Hogarth Press, the Whittington Press had printed, and in most cases published, sixty titles and was just embarking on its major step forward, the casting of its own type. While typecasters were switching off their pots on an almost daily basis, their bewitching equipment could be had for little or nothing. 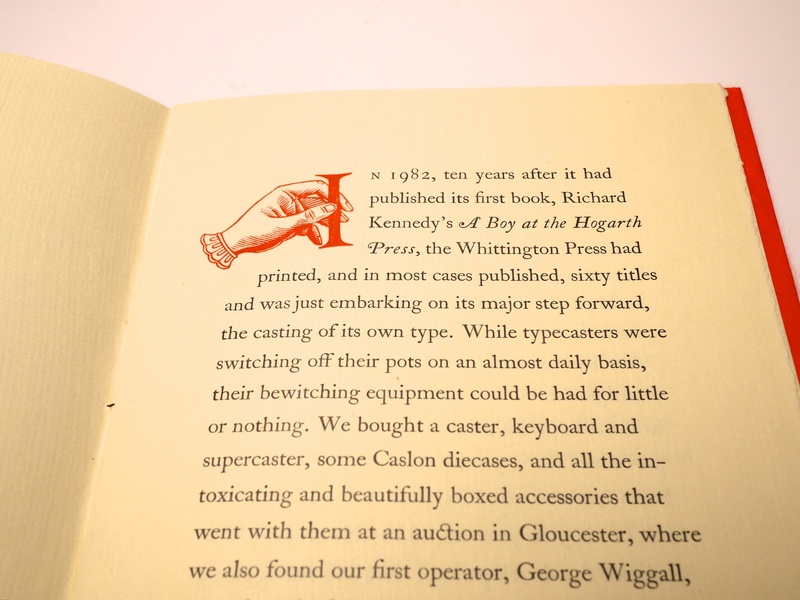 We bought a caster, keyboard and supercaster, some Caslon diecases, and all the intoxicating and beautifully boxed accessories that went with them at an auction Gloucester, where we also found our first operator, George Wiggall, recently retired as a Monotype caster and bored with spending the mornings in the park with his dog every day. 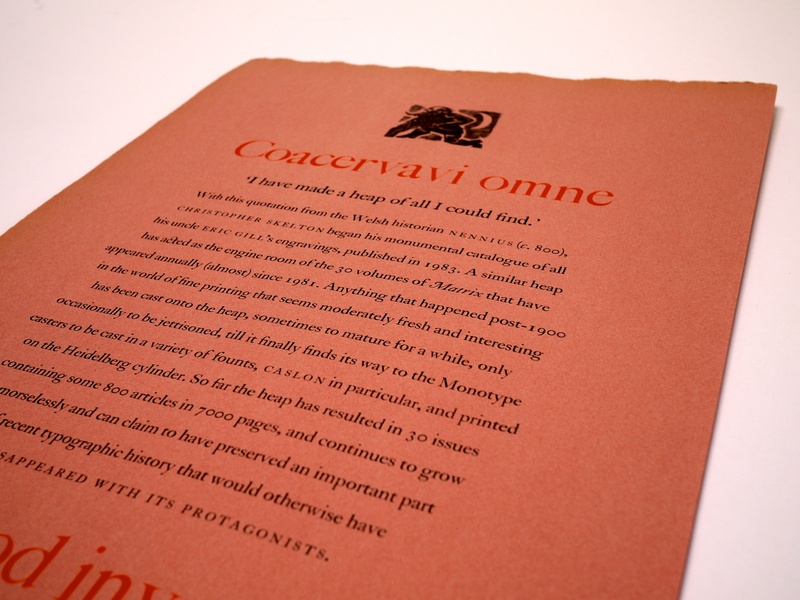 We rapidly extended our range of typefaces, particularly in the rare large-composition sizes (16– to 24-point), and with the acquisition of Oxford University Press’ Monotype repertoire in 1986 we had one of the most comprehensive collections anywhere. Suddenly we were able to take on large-scale publishing projects, and the first issue of our annual Matrix in 1981 was on result of this. The fascination of Monotype technology, the combination of extreme mechanical fastidiousness with an unparalleled aesthetic, was without compare since the days of Gutenberg. We, and others like us, were indeed fortunate to be active at the end of his 500-year era, to be able to enjoy the fruits of the developments that had taken place since then, and to be able to do so at no cost by rescuing machines that would otherwise have met their end with the sledgehammer. The Press started off with an underpowered 1830 Imperial hand-press bought from the Totnes Times in 1971. The larger and more powerful 1848 Columbian, bought the following year, was used for our earliest books, and a few posters, but it is now relegated to a useful work surface, & a source of constant fascination to children when its eagle rises from its perch through the hole in our ceiling. Most of our other two-hundred-odd books have been printed on the four-ton Double Crown SW2 Wharfedale bought from the Compton Press for L50 in 1974. In 1986 the continued growth in the extent and run of Matrix necessitated the hugely increased productivity of the 22 x 30 ins Heidelberg SBB cylinder press, which has also been used for some of our other, larger, titles. The FAG proof press, bought at about the same time, is in constant use for proofing and other smaller projects. As I mentioned before, this is the first time that I’ve seen any of the work done by the Whittington Press, and even though these are only some ephemera and posters (apart from Matrix, which I’ll review in an upcoming post) I’ve been really impressed. 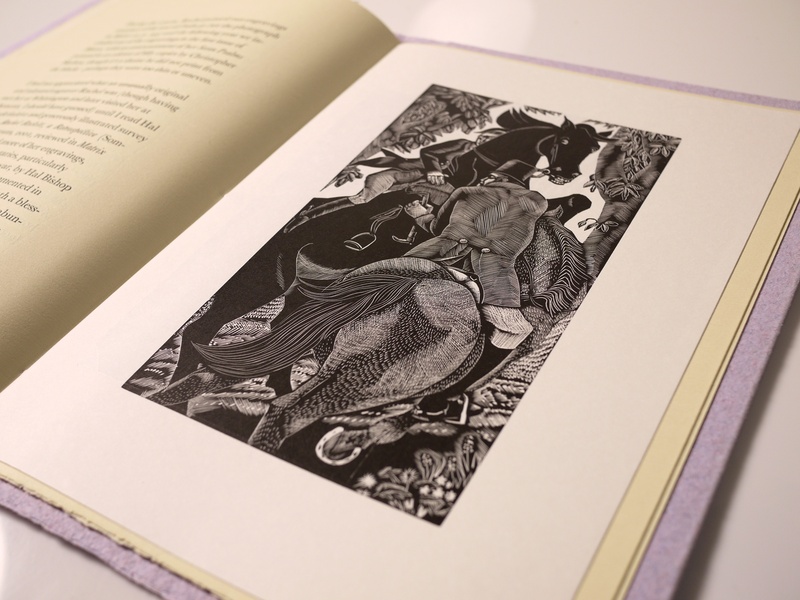 Fine paper, sharp, crisp text and wonderful engravings which give you a really good idea of what to expect from the books themselves. I’ll be looking forward to adding some of the Press’ books to my library in the future. The posters too are quite lovely, and I’ll be framing the one that celebrates Matrix’s fourth decade and putting it on my wall soon. 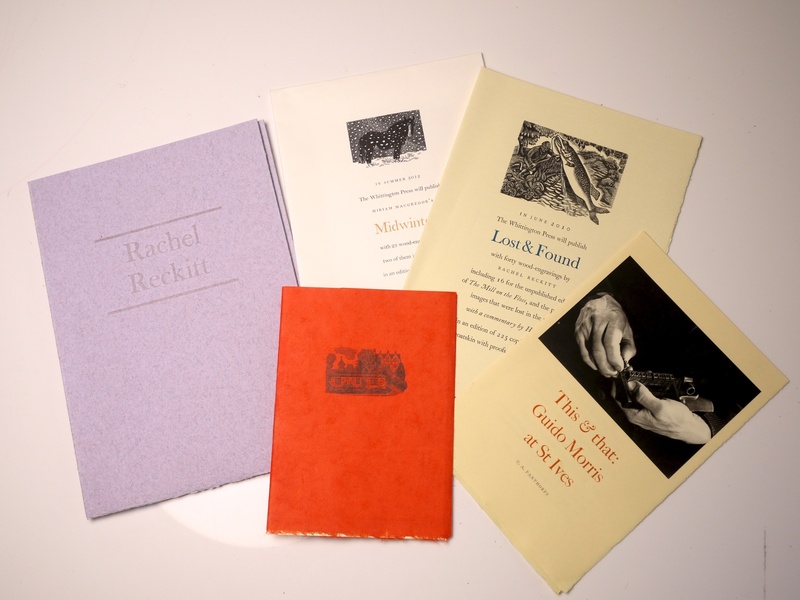 Posters and Ephemera from the Whittington Press (The Whittington Press): a few prospecti, the Rachel Reckitt booklet containing three wood engravings and the little booklet Gutenberg & Whittington. 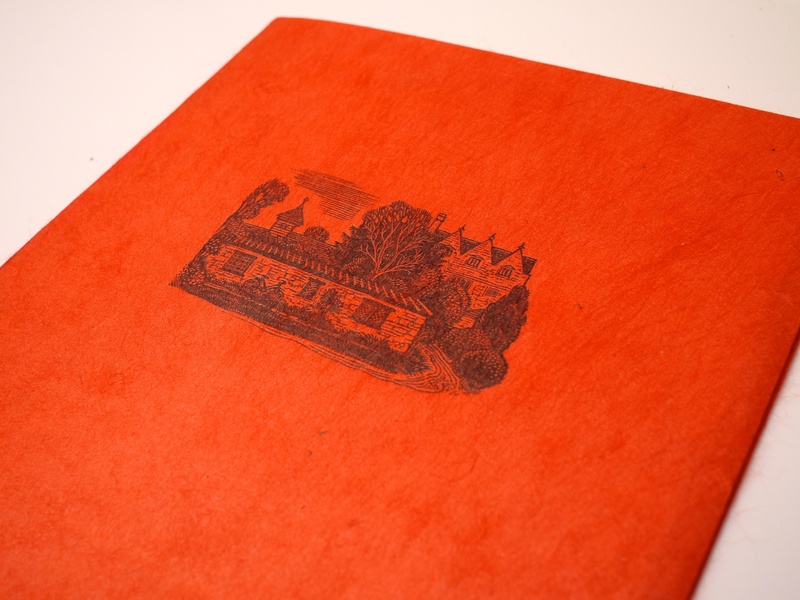 Posters and Ephemera from the Whittington Press (The Whittington Press): close-up of the Rachel Reckitt booklet binding. 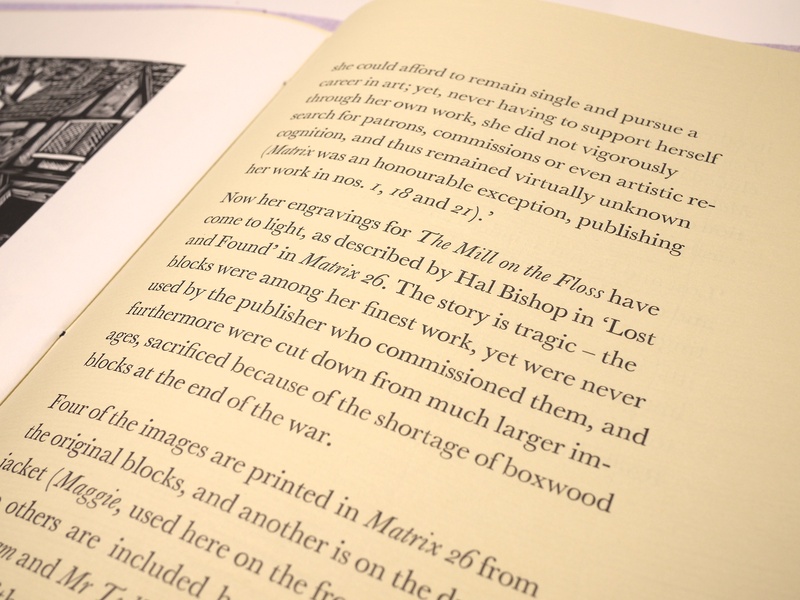 There were 160 copies (80 for Matrix 26) printed on Zerkall mould-made paper and bound in Wookey Hole hand-made paper. Posters and Ephemera from the Whittington Press (The Whittington Press): Rachel Reckitt booklet frontispiece and title page. 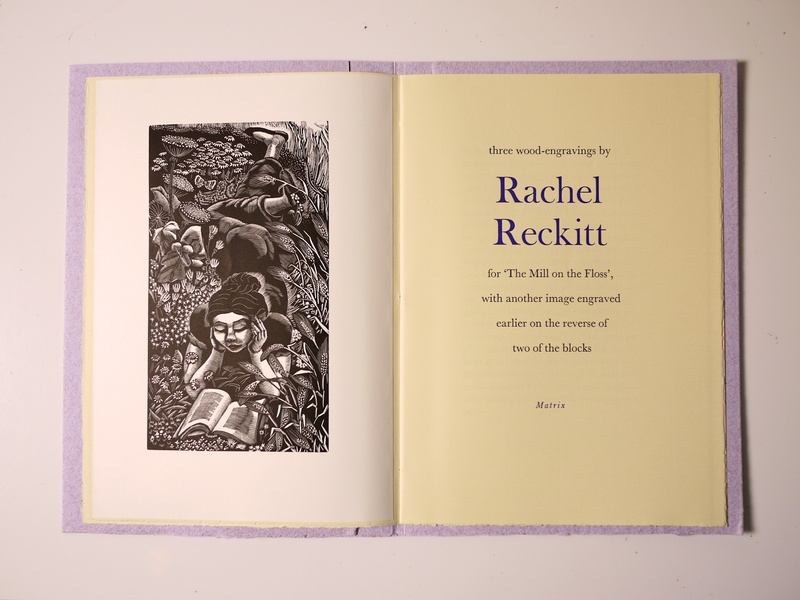 Posters and Ephemera from the Whittington Press (The Whittington Press): Rachel Reckitt wood engraving #1. 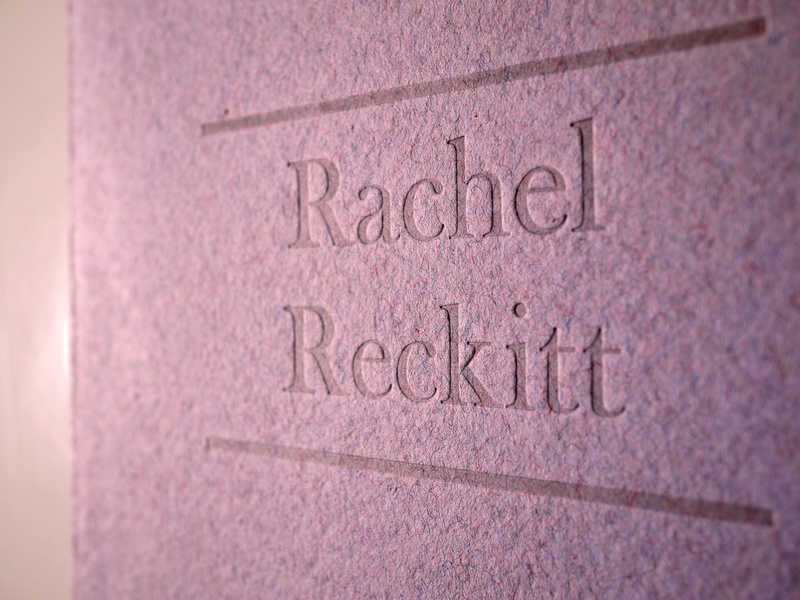 Posters and Ephemera from the Whittington Press (The Whittington Press): Rachel Reckitt wood engraving #2. 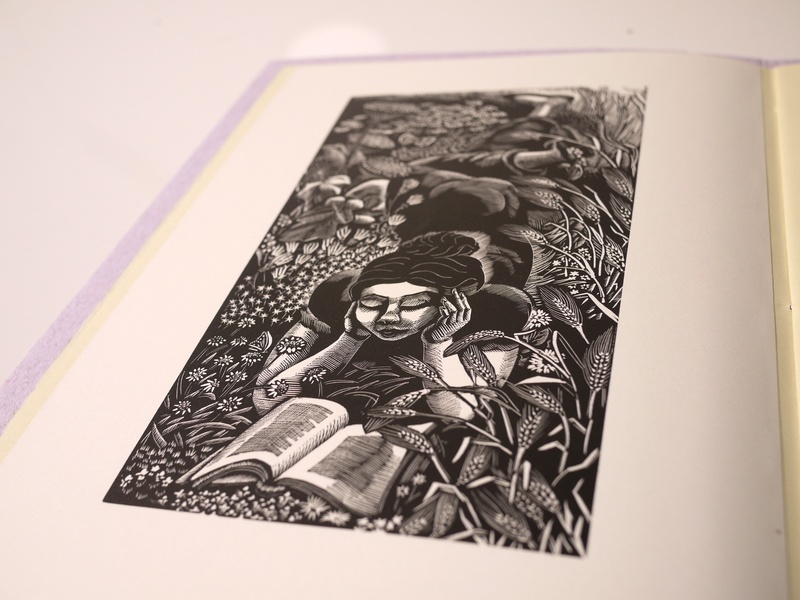 Posters and Ephemera from the Whittington Press (The Whittington Press): Rachel Reckitt wood engraving #3. 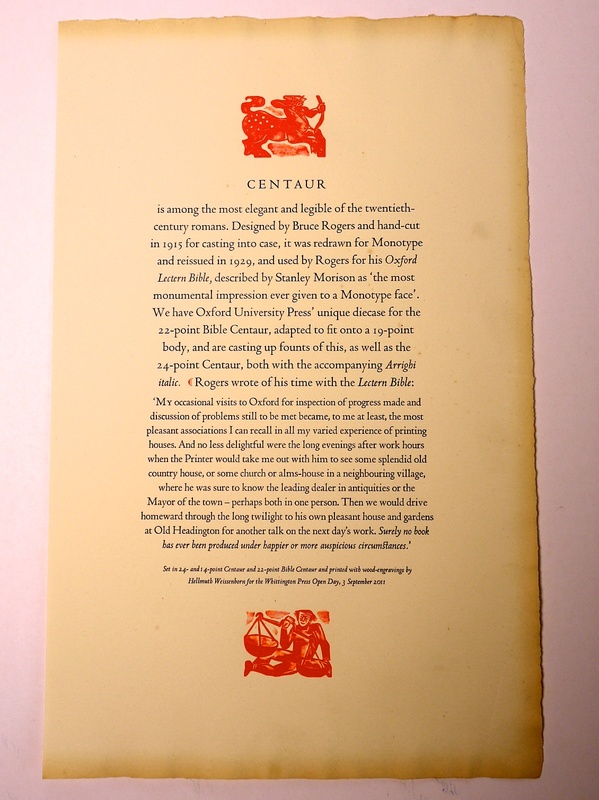 Posters and Ephemera from the Whittington Press (The Whittington Press): sample text explaining how some of the Rachel Reckitt’s wood engravings were damaged. 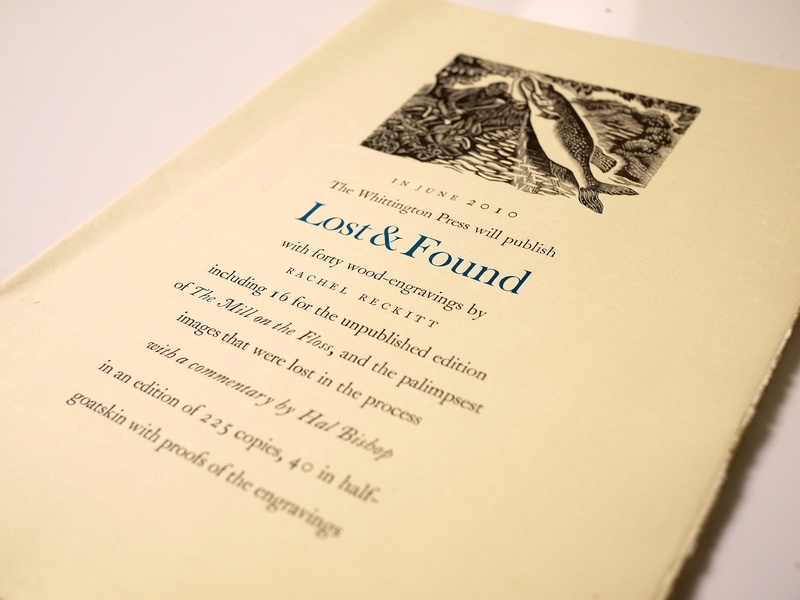 Posters and Ephemera from the Whittington Press (The Whittington Press): the prospectus for the Rachel Reckitt book, Lost and Found. 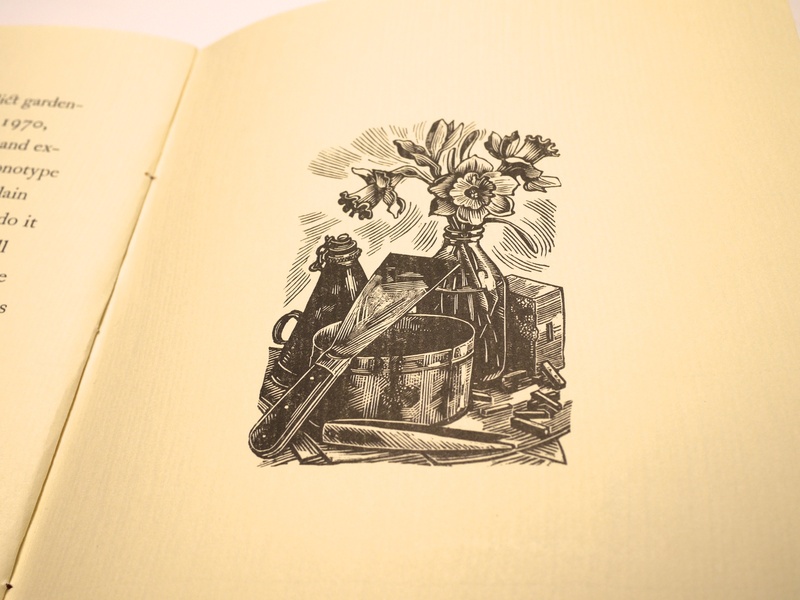 Posters and Ephemera from the Whittington Press (The Whittington Press): Gutenberg & Whittington: a wood engraving of the gardener’s shed that houses the Press. Posters and Ephemera from the Whittington Press (The Whittington Press): Gutenberg & Whittington sample text with a lovely drop cap. Posters and Ephemera from the Whittington Press (The Whittington Press): Gutenberg & Whittington wood engraving by Miriam Macgregor. 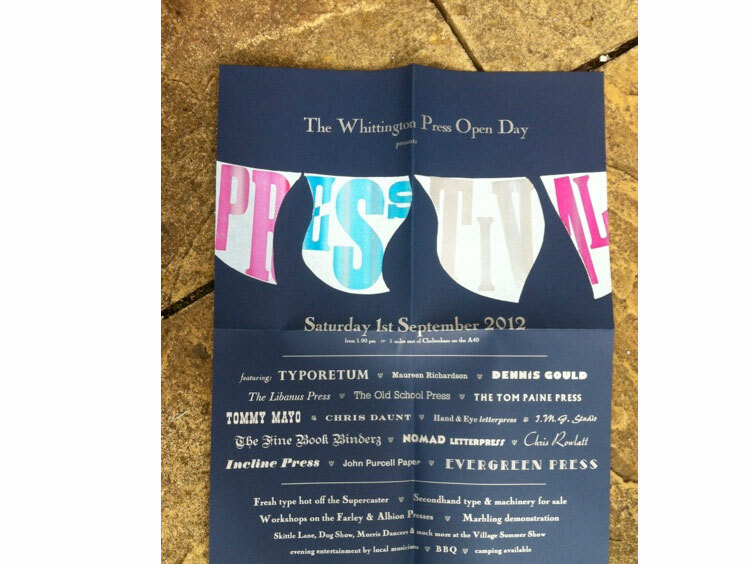 Posters and Ephemera from the Whittington Press (The Whittington Press): poster #1. An extract from an article appearing in Matrix 7. Posters and Ephemera from the Whittington Press (The Whittington Press): poster #1 close-up. 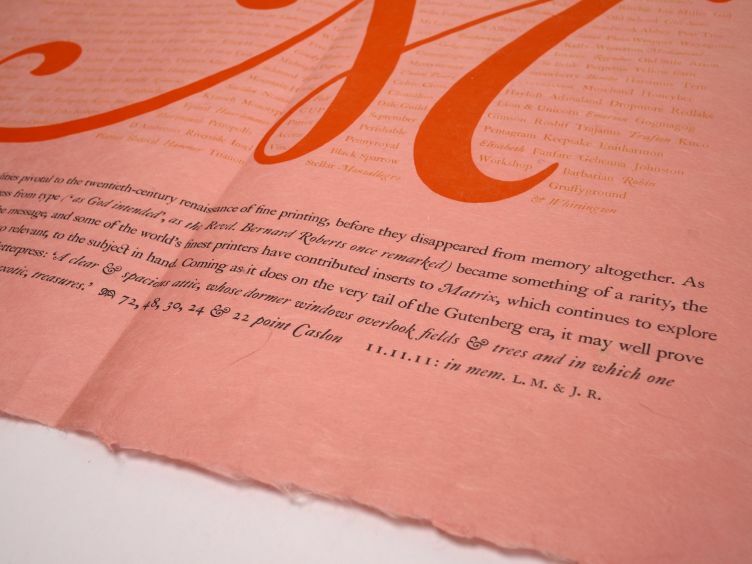 The poster allows them to show off the different sizes, variants and ligatures of the typefaces they have in their possession. They all come together quite nicely. Posters and Ephemera from the Whittington Press (The Whittington Press): poster #1 macro. 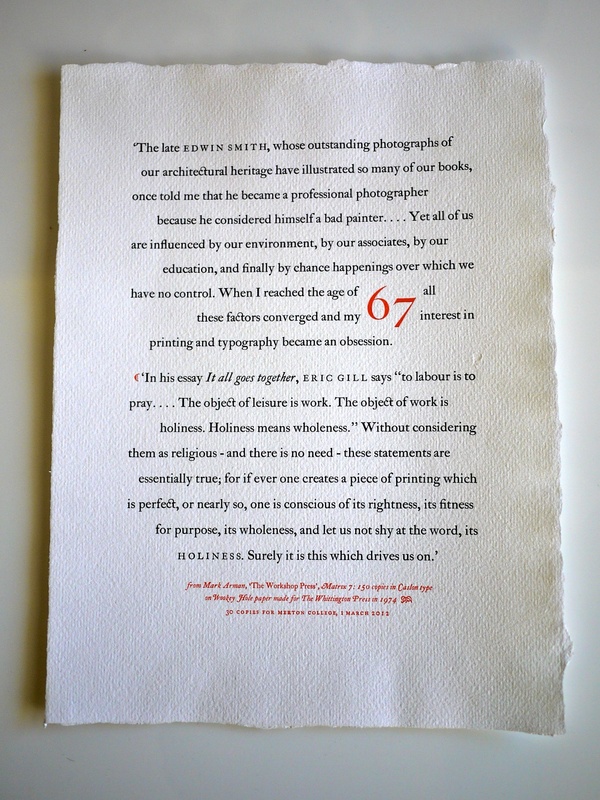 Posters and Ephemera from the Whittington Press (The Whittington Press): poster #2. Some of their larger Centaur sizes, produced for the 2011 Open Day. 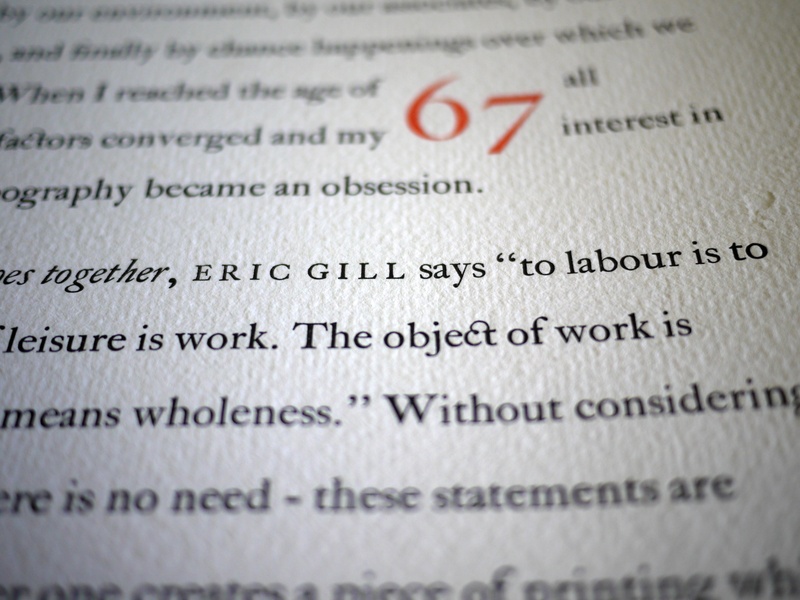 Posters and Ephemera from the Whittington Press (The Whittington Press): poster #2 macro. 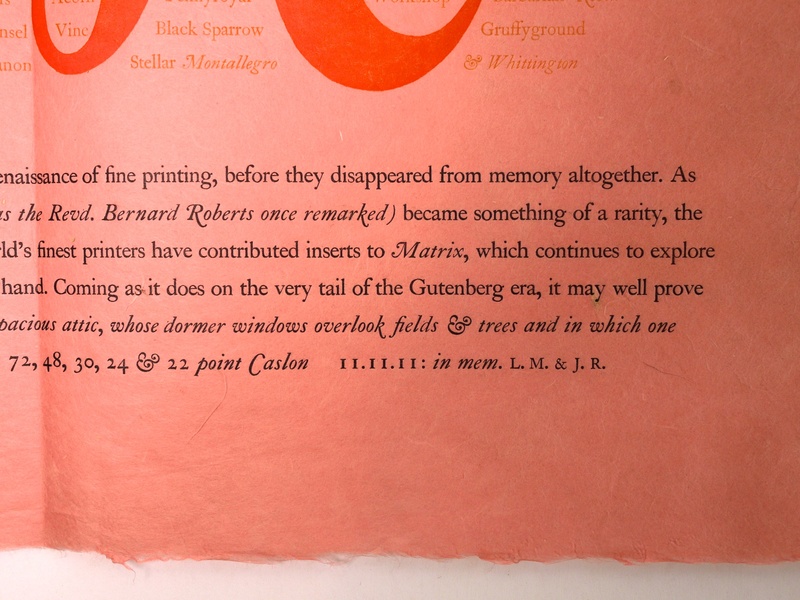 Posters and Ephemera from the Whittington Press (The Whittington Press): poster #2 colophon information. Posters and Ephemera from the Whittington Press (The Whittington Press): poster #3. Another opportunity to use some larger Caslon type. 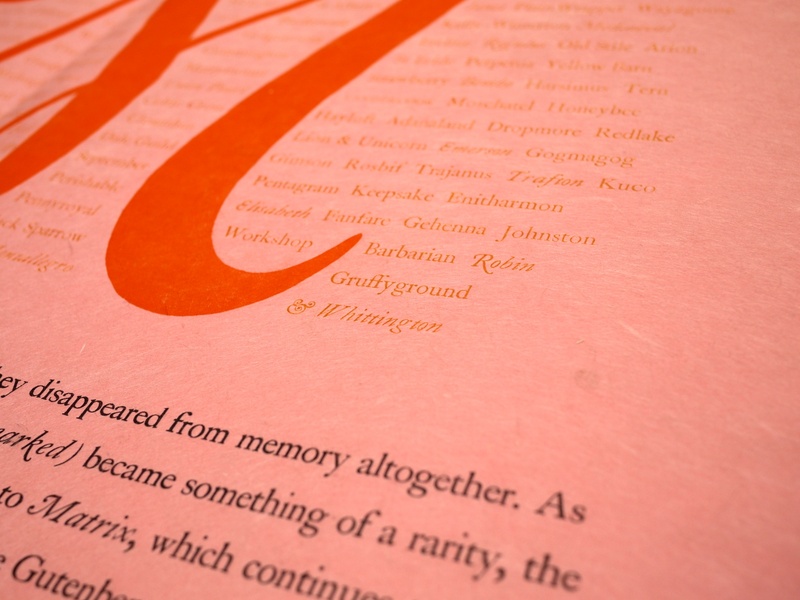 John Randle is a huge, unapologetic fan of Caslon. 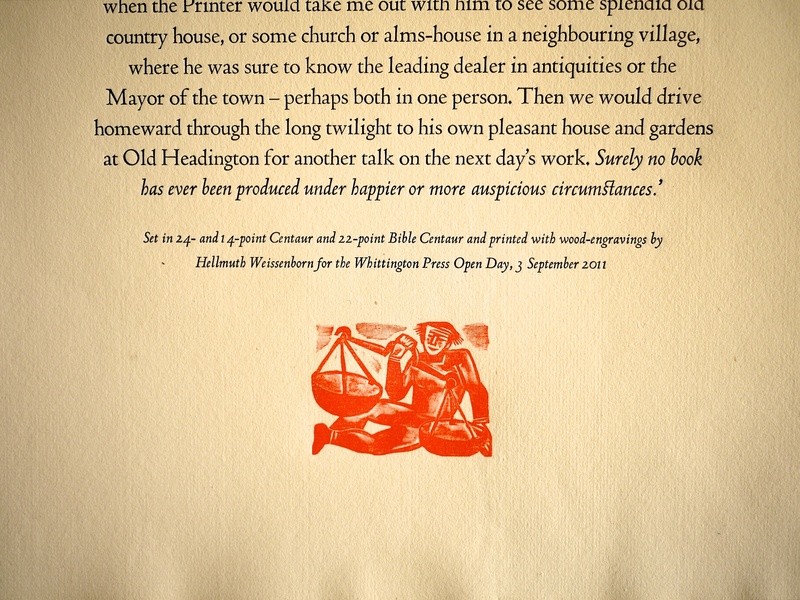 Posters and Ephemera from the Whittington Press (The Whittington Press): poster #3 close-up. Posters and Ephemera from the Whittington Press (The Whittington Press): poster #3 again. 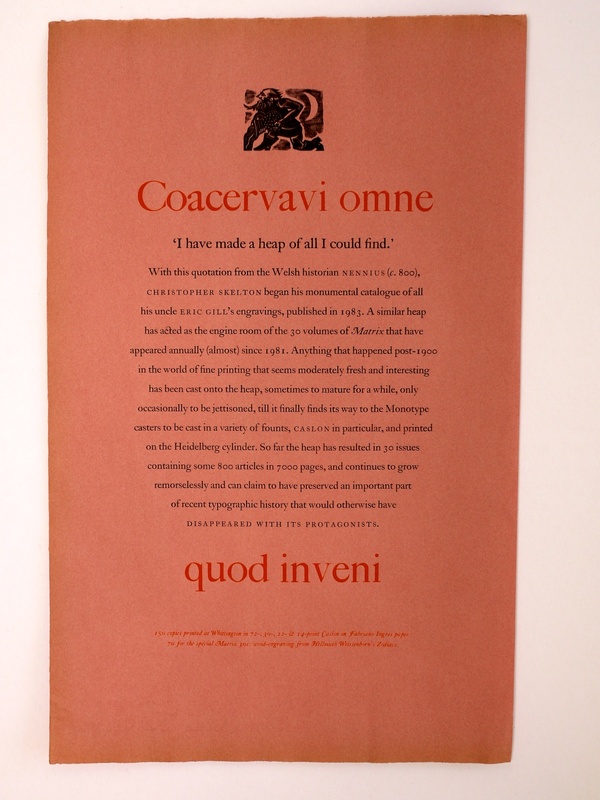 Posters and Ephemera from the Whittington Press (The Whittington Press): poster #4. Celebrating the fourth decade of Matrix. This is my favourite poster, and it’s just asking to be framed and hung on a wall. Posters and Ephemera from the Whittington Press (The Whittington Press): poster #4 close-up, be sure to click and load the larger version. 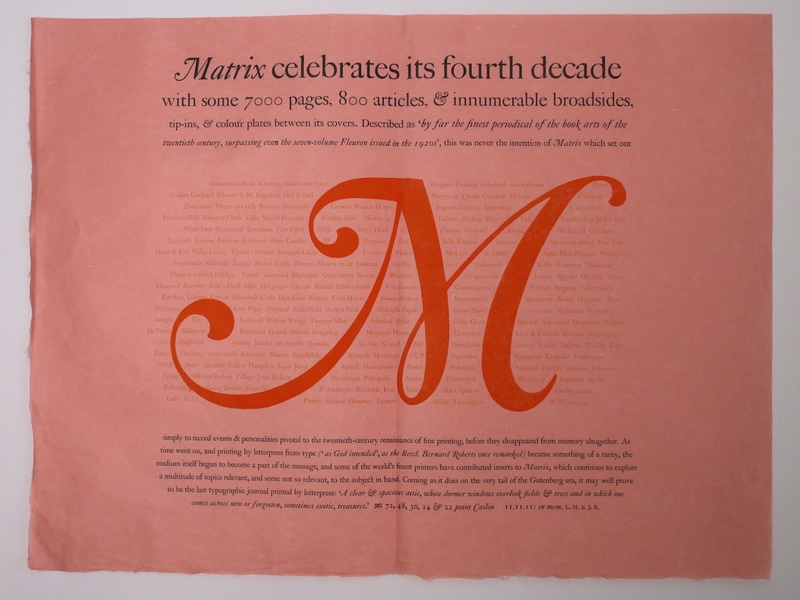 Posters and Ephemera from the Whittington Press (The Whittington Press): poster #4: the poster pays homage to a number of other fine presses, typeface designers, authors and much more. I think the Pentagram refers to the branding agency. Posters and Ephemera from the Whittington Press (The Whittington Press): poster #4. Some of the colophon information. Photography © The Book Blog. This site is for educational purposes only. All copyrights are retained by their respective owners.